Choose the "Chairman's Award" Best Western University Inn convenient to Murray State University, CFSB Center and the Murray Industrial Park. Relax and stay connected with complimentary Wi-Fi in your new guest room. Unwind in front of the 32-inch LCD HDTV. Enjoy the comforts of home with an in-room microwave, coffeemaker, and refrigerator. Upgrade to a two room suite for more space including two 32 inch flat panel TV's and a wet bar. Wake up each morning to a free hot breakfast and USA Today ! Take your pick from a selection of great breakfast items including scrambled eggs, biscuits & gravy, sausage and Belgian waffles. The pool is sparkling and the fitness center is challenging. We have a special flair for hosting business functions from 5 to 75 guests. A local favorite, Tom's Grill, is adjacent and Applebee's Bar and Grill is nearby. The hotel is near Briggs & Stratton, Pella Corporation, Kenlake Foods, Pulmo-Dose, Vanderbilt Chemical, Iwis Motorsystems and Paschcall Truck Lines. Explore beautiful Kentucky Lake and Land between the Lakes National Recreation Area just 15 minutes away. The lake area is known for world-class bass fishing, hunting and water sports. Nearby Miller Memorial Golf Course offers a variety of challenges for the most discriminating golfer. Saddle-up and attend the rodeo or various other events at the Expo Center. Enjoy your stay. From: The north. Take Interstate 24 to Purchase Parkway South or US Highway 641. 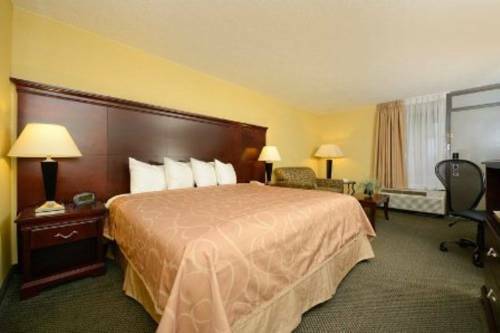 Drive south to the Best Western University Inn. From: The east. Take Interstate 24 to US Highway 68. Continue west and exit on State Route 94. Go to US Highway 641. The Best Western University Inn is just ahead. .01 mile(s) from Tom's Grill, 11:00 a.m. to 10:00 p.m.
.5 mile(s) from Applebee's, American, 11:00 a.m. to 10:00 p.m.
1 mile(s) from Ryan's Restaurant, American, 11:00 a.m. to 10:00 p.m.
1 mile(s) from Cracker Barrel, American, 6:00 a.m. to 10:00 p.m.
King Neptune, U.S. Navy mascot pig, raised over $19 million in war bonds during World War II "to help make a free world," according to his tombstone.